A clinical examination, in which the candidate must perform basic CNA skills in a clinical environment. If you’re having trouble studying for the CNA license examination, follow these helpful preparation tips to improve your chances of receiving a passing grade. 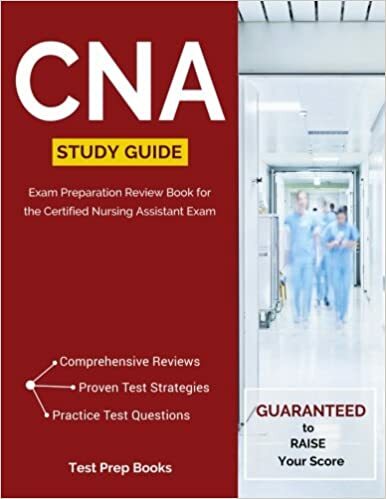 Useful CNA study guides are readily available online. You can find your state’s study guide by visiting their licensing and certification website, or by visiting the site of the third party that administers the exam, such as Pearson Vue. Study guides will provide useful information regarding test format. What is helpful about study guides is that they will help guide you through the actual test format. For those that find challenged timed standardized test formats challenging, a study can walk you through the basics of a written CNA examination. Additionally, there will be sample tests included that will help you practice sample questions that have been taken from previous versions of the test. Just like any other major standardized test, setting aside ample time to study is essential to your success. One of best methods to go about this is to schedule at least ninety minutes a day, five days a week to study. Concentrate on one area of the exam, such as Patient Rights or Ambulating the Patient, each time you sit down to begin your study session. The amount study time can be adjusted if you have a minimal amount of days left before your exam. Depending on your state of residence, hands-on activities in a clinical setting may be part of the exam. Make sure to attend a training seminar that specifically discusses this part of the exam. Continue to practice until you are thoroughly familiar with every procedure. Another preparation method for hands-on training is to watch some CNA skills test videos. These videos will visually demonstration many of the hands-on skills that a CNA must master when working with a patient or client. These hands-on skills include bedpan assistance, recording radial pulse, recording blood pressure, feeding, bed bath assistance, and performing passive range of motion. Taking a written CNA practice test is an extremely helpful method to prepare. Practice tests are formatted exactly like the real thing, offering you the best opportunity to get used to the types of questions that will be asked on your test day. Additionally, taking practice tests will get you accustomed to the timing and flow of how the tests go. Tests are segmented into the various skill areas that you have studied about throughout your CNA training classes. Most practice tests online will incorporate previous actual questions from the exam, so they are helpful learning tools. However, only the written section of the test is available for practice. In order to effectively prepare for the clinical portion of the exam, you must practice hands on. After you have gone through your classroom training, it is recommended to watch some CNA skill videos. Then it is recommended to practice some of the hands-on skills on a dummy or a sample patient to truly get good practice on interacting with the patient.